Freeze two balls at the foot spot so that the back ball is in a dead line to the center diamond on the foot rail. Place the cue ball near the head string in line with diamond no. 6. 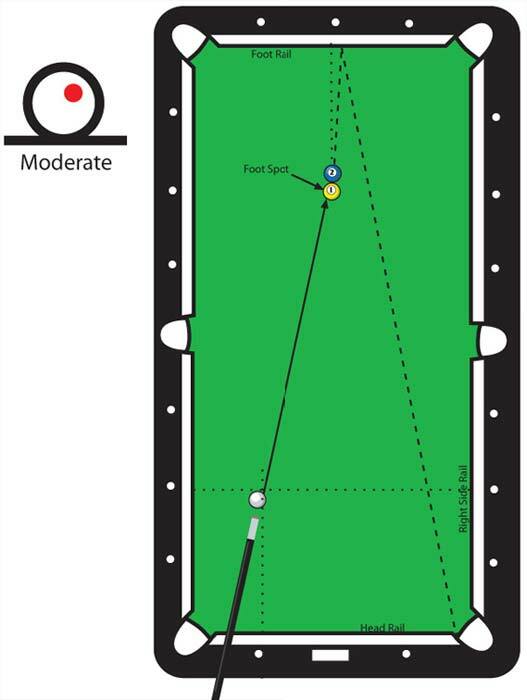 Shoot the cue ball directly at the center of the 2 ball just as if the 1 ball were not on the table. Use top right english and a moderate stroke. If the 2 ball banks to the head rail, lighten up your stroke. Should it hit the right side rail, you need to hit the shot harder. This shot may not go in some instances, like a. a bad rail, an unlevel table or new cloth. This is an example of an englished throw bank. Here the first ball crosses the second, producing both throw and english to send it wll off the track of its origional dead position*.